Okay, I just finished reading the Thrawn book. Anyone else finish it? @panki, @sangharen, @applecrumble122, @jakkusun, @Irina de France, @CienaRee, @ISeeanIsland, @IoJovi, @vaderito, @Darth_Awakened and of course, @Darth Dingbat ... anyone else I am forgetting? I looked to see if anyone had started a thread on it, and I could find anything. (Granted it's super late here, so I might have missed the thread, lol). But I have some thoughts on it and would like to hear anyone else's thoughts and discuss the book with them). I really liked Thrawn as a character. He is probably too brilliant, but I think that they are trying to make him like a brilliant Sherlock Holmes, Dr. House kind of character. So how long do Chiss live? IOW, could Thrawn actually show up in the ST? Where is Eli? He would probably be at least a decade older than Luke and Leia, but younger than Vader. He could probably be alive, yet pretty old, in the ST. I need to read-over the Aftermath books now that Yularen has been mentioned so much. When did Thrawn meet Anakin? Was this in TCW or a comic or not shown yet? I like how Thrawn has hidden the Chiss lands. Those could eventually be a safe haven of sorts. Will the ST go to the UR? Or will that be later movies? Vader is probably very clued in on whatever Thrawn is telling the emperor given the introduction at the end. Will Thrawn be able to figure out that it's Anakin? Does that get Thrawn killed or ... will Thrawn end up being a helper of sorts to Vader in his search for Luke in the new OT comics ... and maybe an influence for some of Vader's turn back to the light? Arihnda kind of turns into the non-FS Anakin/Vader doesn't she? There's more, but I am tired and I want to see what others' impressions are. I was especially thrilled that Arihnda didn't turn out to be a set up for joining the Rebellion but quite the opposite. I'd say she's a female Tarkin. Oh, and bonus points for Arihna's "you need a teacher" moment with Thrawn at the end. Thrawn and Eli are totally shippable. Cause Thrawn is indeed like Cumby's Sherlock, and I know that fanboys wanted him to play Thrawn in TFA, I couldn't stop imagining Thrawn as Blue Cumby. Loved Chekhov's Gun with the bully from the Academy, that Thrawn set up to become a pilot due to his fighting tactic, and he did become a great one! It's always great when things that seem like a one-off plot device have a payoff later. The near end with Thrawn and the Rebel leader was great. Unknown Regions threat better be Snoke or it's truly pointless. I hope we get a book that follows Eli and the Chiss. Yes! I became completely involved with the non-movie characters. That is not always the case with these books. I've never watched Sherlock, so I only have the Rebels animation to go on. So I thought of someone more symmetrical looking than Cumberbatch like Fassbender or Tom Hiddleston. I don't know who I thought of as Eli. Somebody young-ish with dark hair. I will have to think on that. I could see Thrawn and Eli as a ship, lol. At first I thought there might be something with Arihnda and Thrawn, but then she started going down her bad path so nothing is going to happen with them. I can see that Tarkin/Arihnda similarity, but she actually still reminds me of Anakin enough because she does some really terrible sith to save her parents at the end, which is similar to Anakin with Padme. Tarkin never seemed to care enough about anybody for that kind of behavior. Also, like Anakin she keeps getting caught in snares for a while and she deteriorates morally with each snare. She's never really that moral to begin with, but like Anakin she seems to get more caught off guard and and falls into rash decisions more than Tarkin, who never seemed to be phased by much of anything. Thrawn and Nightswan were awesome. It really is going to make me watch Rebels differently now. The fighter pilot thing was fantastic. That was all JK Rowling with an obscure detail becoming important later. I love that. Don't worry. The UR is going to be a big deal. In many ways Thrawn might be the most reliable narrator in the whole SW canon right now. If he says something really bad is out there, it is. I would love an Eli with the Chiss book. I also love how Thrawn is this outsider who can see the problems in both the Republic and the Empire, but isn't so ideological. He's just about solving problems and saving people's lives whenever he can. @solosidecousin Thanks for tagging me. I'd be interested in discussing. Unfortunately, I haven't read it yet because I've been stuck on a library waiting list for the book, but I think might get my hands on it soon. @SoloSideCousin : thank you for creating the thread. @panki and I had a couple of exchange in the SW Rebels Season 4 thread about Thrawn. Do we have to use the spoiler tags in a spoiler thread? I am lazy and I sometimes cannot open the spoilers depending on which device I use. I am the opinion that there will be no character crossover between books/animated series and the ST. There might be names being mentioned as an Easter egg, but even there I am not sure. I know they did that in R1, but that movie was fan service. I think TLJ will be a different beast and will go its own way redefining the mythology with the new characters. Any link to other existing products will be treated as a bonus. The GA is still the main target audience, I think, and you would not want to lose them. They might use parallels. A character in the ST that reminds you of a character in a book, but that would imply that everyone is working closely together to have similar character background and development. I can see the UR being mentioned, but not explored in the ST. The best candidate to mention them is Snoke and it'd make sense he comes from there or has been there. However, I could see them keeping the UR as a mysterious place. Sometimes the less you see, the scarier it is. Example : the first Blair Witch Project versus the second one. Different genre, I know. I am waiting for the book Phasma to reveal if she is a former feral kid. If she is, she might have been on the ship to the UR and we could get some insight on the UR there. Could be, though, that Phasma has completely different origins. She is utterly polite for a former feral kid with her "Sir" here and there. Another thing that might go against the UR being expanded on in the ST is that if linked with Snoke, which is so far the most logical assumption, and with RJ saying that Snoke is not a big focus in TLJ, well, the UR sound more like something kept for the hungry devoted fans. Or they are kept for episode IX as a foil to what I think will be more important i.e. the Jedi Temple and the story of the Jedi. I wonder if Luke and Ben could have gone to the UR... Anyways, there's only so much you can pack in a movie. This post is getting too long so I'll use up another one later. Don't know where to put that, but it's an interview of Timothy Zahn. I like how he describes the OT trio and that he likes Metallic-Bikini-Leia strangling Jabba and why. It's actually one of my favorite scenes in the OT. To me the fact she was in this metal bikini always added something to the scene. Jabba degraded her into this display doll slave and she turned it back on him. I find it very satisying. Anyhow, he's talking about the inspiration for Thrawn mentioning Romans, which does make sense. I found it fascinating being at the writer panel at the SWC how different each writer is. Timothy Zahn looks like the hard-working academic writer and I think he has a systematic approach to writing. A bit like Thrawn with military tactics Chuck Wendig looked more like the rock n' roll guy, cracking jokes left and right. 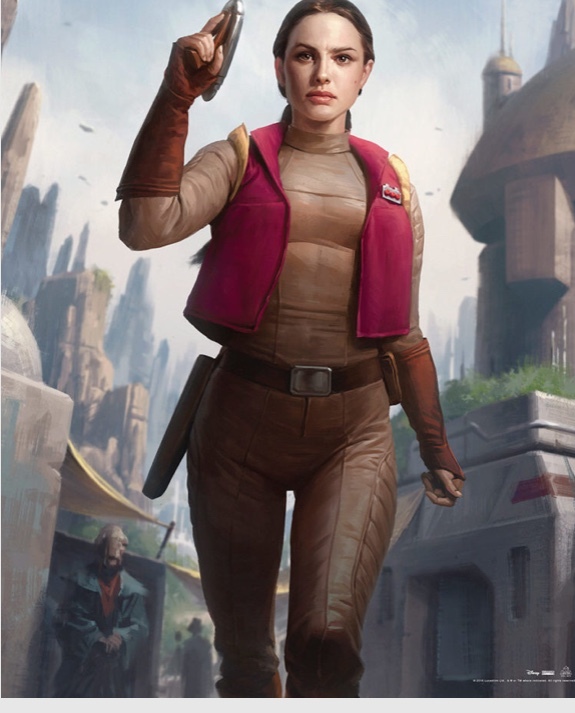 Delilah Dawson looked like the determined newcomer and I can't wait to read Phasma - she writes with a playlist and one included the Fury Road soundtrack! Okay I finally read it. xD Probably my favorite Star Wars book right now, after Bloodline. I thought Thrawn seemed a lot more "good" and even noble in this book than how I saw him in Rebels. I wonder if that is just because this story is from his perspective, though. I certainly do like the character a lot more now. And yeah I feel like I have to rewatch the last season of Rebels because I think the whole way I view the character will be affected by this book. Because are we intended to believe that he agrees with a lot of rebel ideals, but believes in achieving them through the current power structure? I feel that might be a bit naive of him xD but I suppose it is one way of doing things if he actually believes that the emperor will eventually die and he will be able to influence who gets put in power. Though it means he leaves Wookiees enslaved while he waits to try and change the government for the better. Though, I suppose in the Aftermath books the New Republic sure took their time freeing slaves, too. Gosh why does no one in the galaxy care about freeing slaves? It is funny that he is similar to Sherlock because Thrawn's voice actor was a villain in Sherlock. haha just a cool coincidence. I was surprised that I actually kind of liked Pryce, even though she is so cruel and selfish...I found her progression into worse and worse crimes when trying to cover up her initial shooting of the guy who wouldn't let her get her parents out made a lot of sense to me...I could empathize with her sense of almost panic? (idk maybe I was panicking cause I felt like I was going to get caught for all the murders right along with her xD) and even though what she did was horrible, I found it easy to put myself in her shoes and understand her actions, which is scary. I like how it seemed as if the whole galaxy was against her and she was against the whole galaxy. I found her very interesting and a great foil/opposite for Thrawn. And yeah it would be great if whatever threat Thrawn was talking about it in the Unknown Regions were a reference to Snoke or something related to the ST.
Hey, some guy on Reddit is saying that there will be a sequel to Thrawn coming out next summer. I hope it's true. I liked that book a lot. Eli is definitely a new favourite of mine. I like how he's just a normal person who had his own plans for how his life was going to turn out before he and Thrawn were thrown together. I also like how, in the early parts of the book, his perception of Thrawn is a perfect bend of annoyance/fascination, but then as the book nears the end he and Thrawn have really become friends - well, they have mutual trust/respect, at the very least. There is a disconnect between the Thrawn in Rebels and the Thrawn in the novel. The former is a straight-up bad guy, but the novel gives us someone a bit more interesting. @Armadeus I wonder if the upcoming season might fix that disconnect or not. @SoloSideCousin wrote: Hey, some guy on Reddit is saying that there will be a sequel to Thrawn coming out next summer. I hope it's true. I liked that book a lot. me too! Big fan, would love a sequel especially if it takes place with the Chiss. I also want Thrown and Eli to finally admit their feelings. That cover is awesome. Vader and Thrawn! I love Thrawn book so hopefully the sequel is just as fun. I didn't know there was even a Thrawn thread till I did a search. I only have a hazy knowledge of Thrawn through watching a few Rebels with my son. But I'm really intrigued after the last episode aired. Reading through this thread I think it would be wise for me to read the first book before the next one is released in July. They've released this excerpt which has really raised my curiosity as it includes Batuu- both Vader and Thrawn have history there. @MrsWindu wrote: I didn't know there was even a Thrawn thread till I did a search. I only have a hazy knowledge of Thrawn through watching a few Rebels with my son. But I'm really intrigued after the last episode aired. Reading through this thread I think it would be wise for me to read the first book before the next one is released in July. Wow! It's interesting. I wonder what's on Batuu that has to do with Vader's past. Though, I'am wondering if Batuu is another "dead end" in the canon only being mentioned in the novel (like many things in Bloodline or Aftermath that we thought important at the time, or nonetheless will have some appearance in IX. Color me confused if they have decided to build a whole new place as a part of the Galaxy's Edge if it will feature only in one novel. I don't think it's a dead end just that very reason. They won't build a "planet" that only 1% of the audience has heard of. It will be in the movie somehow. Same. I remember that the original synopsis/planet announcement for Galaxy's Edge described it as a "good place to hide from the First Order," so I'd think it would have some relevance in the ST. I think it's likely that we'll get at least a passing reference to it in IX. I'm excited about the sequel and I'm shipping Thrawn/Eli so hopefully they become a couple on screen too (cause obviously they were off screen). New excerpt and pictures . Can’t wait for this book. I have been looking desperately at the release date for Kindle, hoping it’ll change and get issued sooner. I love that excerpt too. The exchange between Anakin and Thrawn is just delicious. I am beyond excited for more Thrawn content! The fact that we get more Vader is just the cherry on top of the cake! With the release of the Thrawn Alliances book right around the corner.. I'm just wondering if anyone has read the series- Thrawn comic adaption of Thrawn novel/s (?) - are they good? 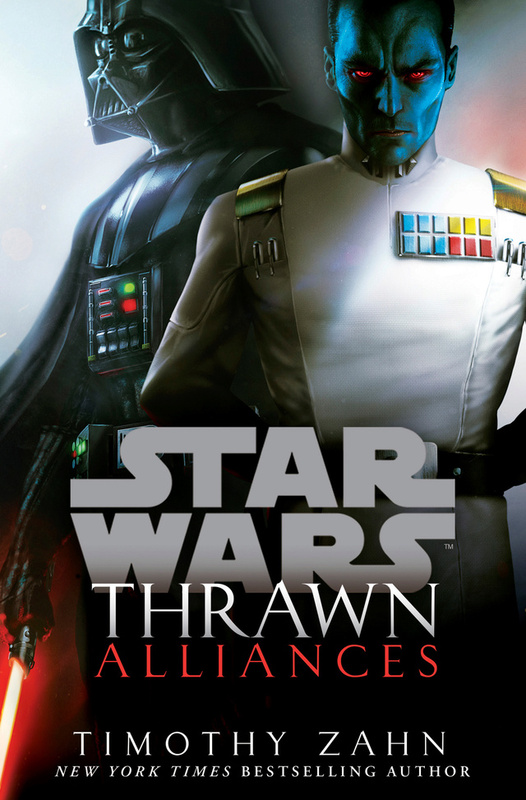 I've ordered Thrawn Alliances but am completely new to Thrawn and any of his character's existing content. Hopefully the book will make some sense anyway. I look forward to hearing what you all think of it! Have you read the Thrawn novel?